The Economic and Financial Crimes Commission (EFCC) has recovered N329.150billion from 10 marketers from 2016 to date. The marketers defaulted in payment for products supplied to them by the Nigerian National Petroleum Corporation (NNPC) through its subsidiary, the Petroleum Products and Marketing Company (PPMC). About N20, 604, 109, 123.90 is yet to be recovered. The PPMC has written to the EFCC to help recover the funds. Following a petition against the marketers, EFCC Acting Chairman Ibrahim Magu raised a special task force to investigate how the marketers incurred the debts of about N349, 818,411,556.37. 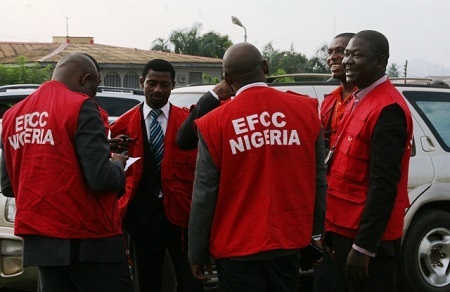 The Task Force, which was managed by the EFCC Zonal office in Kano, recovered the N329.150billion from 10 marketers. After the reconciliation at the weekend, the PPMC gave a status report to the Acting Chairman. The report, signed by Umar Ajiya reads in part: “Further to our previous correspondence to your office in respect of the above subject matter, please note that till date, the debts recovered from major oil marketers include N87, 028, 851, 268.17 and N242, 121, 256,468.03 for legacy and current debts respectively, leaving a balance of N20, 604, 109, 123.90 broken down into N4, 426,439, 240(legacy debts) and N16, 177,669, 883.90(current debts). “These amounts have been agreed with the marketers that they shall be deducted and paid from outstanding entitlements or payments due to the marketers from the Federal Ministry of Finance and which will bring to the end the debt recovery effort. A source, who spoke in confidence, said if the EFCC had not moved in, some of the marketers would have been foot-dragging on the debts. “You can imagine what N349billion can do in the life of a nation. Some of these marketers were supplied products but they did not pay even after selling to customers. “The EFCC detectives are still working on the recovery of the over N20billion still outstanding,” he said. Earlier, the Head of Media and Publicity of EFCC, Mr. Wilson Uwujaren, had given an insight into the breakthrough by EFCC detectives. He said: “Findings by the operatives of the EFCC revealed that the oil marketers were actually indebted to the Federal Government to the tune of N91,519,485,204.44billion between 2010 and 2016. ”Further investigation into the allegation also revealed that the oil marketers had continued to obtain petroleum products from the government without proper payment, in violation of the NNPC/PPMC credit facility regulations. Shady deals in the oil sector, including the fuel subsidy scandal, were said to have cost the nation over N1.3 trillion in 2011. But the manipulation of subsidy claims caused an uproar nationwide. The Presidential Committee on Verification and Reconciliation of Fuel Subsidy Payments had initially indicted 21 firms for fraudulent claims that cost the nation N382 billion but the list was later increased to 25 by the Federal Ministry of Finance, based on fresh evidence. The former Chairman of the Committee, Mr. Aigboje Aig-Imoukhuede, said of the N422 billion scrutinised, N18 billion was found to be duplication; N21 billion was cleared. He also confirmed out of the 116 oil marketing and trading companies (OM&T) invited, 107 honoured the invitation. He said: “Of the N422 billion, N18 billion was found to be duplication. So, the actual amount that was being verified is N403 billion. Of this amount, N21 billion was cleared and that leaves N382 billion as the sum in contention for which the committee recommended that the process of recovery should be made,” the report noted.